Stunning street art, Williamsburg spillover, food/drink influx, real estate gold rush, and a complicated history characterize Bushwick and East Williamsburg. 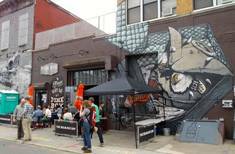 The borderland of East Williamsburg and Bushwick has generated huge buzz for its influx of artists and hipsters moving east along the L train from Williamsburg, and galleries, bars, restaurants, and building conversions have proliferated. But these neighborhoods have a deeper, more complicated, and more fraught history. We'll see signs of Bushwick's brewing history, fueled by a German population, in mansions and closed breweries. We'll see a few signs of the neighborhood's Italian heritage, and more that reflect the Latino (Puerto Rican, Dominican, Mexican, Ecuadorian) presence that later transformed Bushwick. While we won't see 1970s decline (including a massive blackout, looting, and arson), we will see the response: the public investment in housing and other structures spurred by neighborhood activism and local political leadership. We'll see a park named for a brave crusader against drug dealing. And we'll see the new investment, both recent and in-process, that has both drawn media attention as well as local resistance to gentrification. It's at the heart of some recent gentrification debates, such as in the series from WNYC/The Nation called "There Goes the Neighborhood." We could easily extend a Williamsburg tour to visit East Williamsburg and Bushwick, focusing on the street art and (on weekends) some galleries. But we also can spend a full tour looking more broadly at these changing and charged neighborhoods.